If you are learning Portuguese, you probably know how to say Brazilian in Portuguese. And you likely know how to say your own nationality. But you can say that you like French wine, love Swiss cheese, cannot live without Indian food, and drive a German or Japanese car? 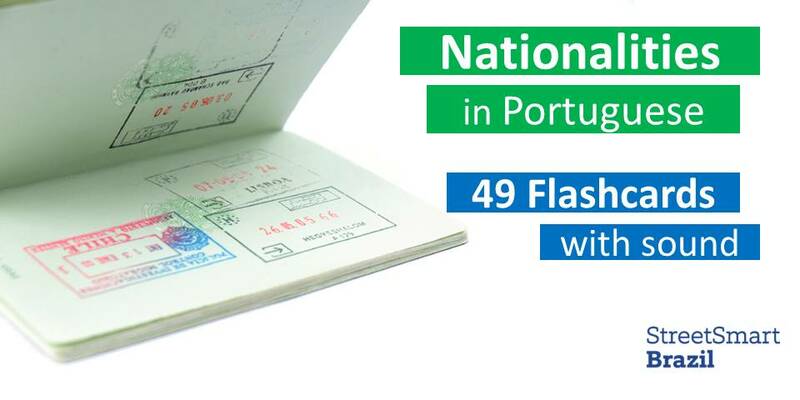 Check out our flashcards to learn 49 nationalities (= nacionalidades) in Portuguese so you can engage in world conversations confidently. The flashcards have sound so you can learn the pronunciation. Explore the different ways to view the cards, including game mode, to improve your learning experience. For the grammar lovers: These adjectives that say where someone or something is from are called adjetivos pátrios. Notice that we do not use capital letters to write them. One of the best ways to retain new vocabulary is to use it in context. Your brain will retain the new words better if it sees them in real-life use. 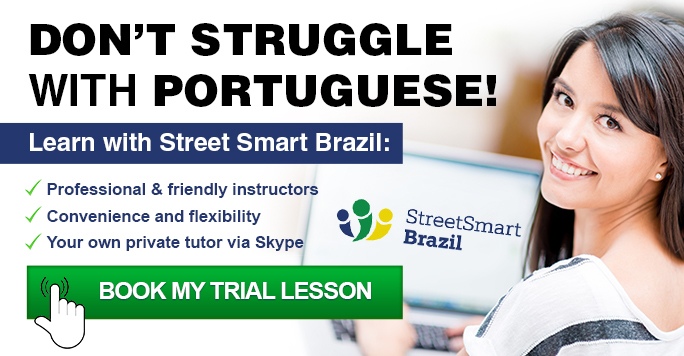 A trained Street Smart Brazil instructor will facilitate your learning through carefully selected class activities and exercises. She will also make sure you are using the words correctly and she will teach you related words and phrases to make the best use of your time and energy. Why struggle with Portuguese when we can help you speak comfortably? Book a Trial Lesson to see for yourself the difference it makes when you learn with a great instructor. A leitura eletrônica deixou algumas incorreções. Por exemplo, europeia virou “europêia”, e sueco virou “suêco”. Oh, that is sad. Thank you for letting me know. Unfortunately I cannot change that.